Union Minister of State, Ministry of Food Processing Industries, Sadhvi Niranjan Jyoti said every farmer in every state should not be left behind while taking up government’s initiative to double the farmers’ income. 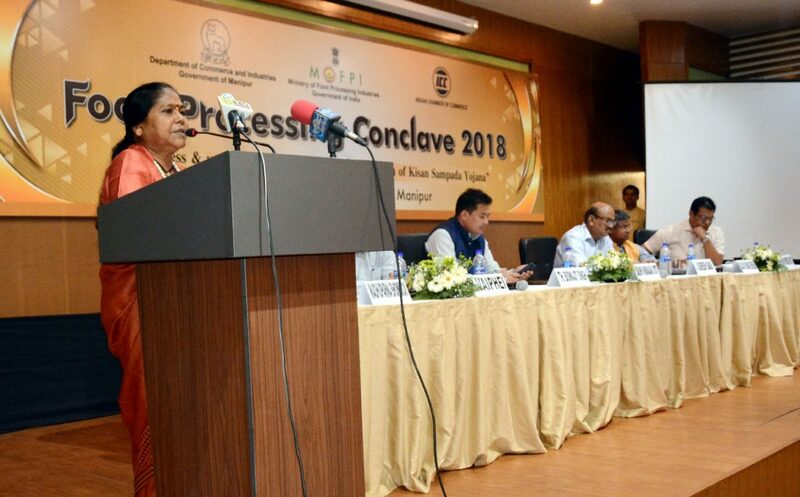 Union Minister Sadhvi Niranjan said this while addressing the one-day food processing conclave held under the theme ‘Awareness and upgradation of technology and promotion of Kishan Sampada Yojana’ in Imphal on Monday. In order to promote and uplift the food processing industries in the State and also to encourage home food processing units, the Conclave was jointly organized by Ministry of Food Processing Industries, Government of India and Indian Chamber of Commerce with the support of Department of Commerce and Industries, Government of Manipur. The Minister also admitted that the Food Processing Ministry has been progressing in the last few years, there are many schemes such as Mega Food Park, Cold Chain, Kishan Sampada Scheme, Backward power linkage, though it is difficult to earmark 50 acres of land for Food Park at some places in every state, the Ministry has proposed through Cabinet for small units after proper identification and if Food Park cannot be set up in 12 acres of land, the same land can use to set up a Cold Chain that deals directly with the farmers. She also declared that the Ministry is providing 35 per cent subsidy for Meghalaya region and 75 per cent for Manipur of that only 25 per cent will be borne by the beneficiaries. Stressing that there are certain factors like willingness of the government, condition of the industry, water, electricity etc are to be provided by the government and also stated that the state being the gateway to Asian Highway, the Ministry is ready to provide and assist in making the Kishan Sampada Yojana a success. Attending the conclave, Manipur Minister (Trade, Commerce & Industries) Th Bishwajit Singh said though the State is small as compared to others, it has a good climatic condition, fertile land, water and natural resources especially in agriculture and horticulture areas. The conclave was also attended by Dr J Suresh Babu, Chief Secretary, Manipur, as special guest, P Vaiphei, Principal Secretary (Trade, Commerce & Industries), Government of Manipur, C Arthur Worchuiyo, Director, Trade, Commerce and Industries, Government of Manipur and Madhuparna Bhowmick, Additional Director, Indian Chamber of Commerce.